Since announcing the termination of its business in Singapore, oBike is still struggling to repay local creditors and affected users. When oBike’s new major shareholder, a 29-year-old Costa Rican based in Singapore offered to “take over the company”, the bike-sharing firm agreed on the condition he settles all its debts globally. oBike hasn’t had a ‘brake’ since announcing the termination of its business in Singapore in June last year. Here’s a brief recap: affected oBike users demanded the return of their $49 deposit to no avail, swamping the bike-sharing firm’s Facebook page with angry comments and at that time, it was found that they had chalked up S$22.7 million in liabilities. As they went into liquidation, users and media looking to get answers from oBike headed to their office only to find it empty. LTA ordered the company to remove all of its bicycles by 4 July 2018 and to “pay the relevant towing and storage fees in order to claim impounded bicycles from LTA”. The Consumers Association of Singapore (CASE) in June 2018 added that they had received “772 complaints from oBike customers asking for deposit refunds”. In September 2018, FTI Consulting, the firm in charge of oBike’s liquidation process, reported a S$10 million transfer to its Hong Kong operations in what seems like repayment of a loan worth S$11 million. FTI Consulting’s senior managing director, Joshua Taylor, suspected that some “transactions are inappropriate given the financial position of the company” and police investigations for misappropriation of funds were underway. Previously, FTI Consulting said oBike Singapore owes local users a total of S$8.9 million. 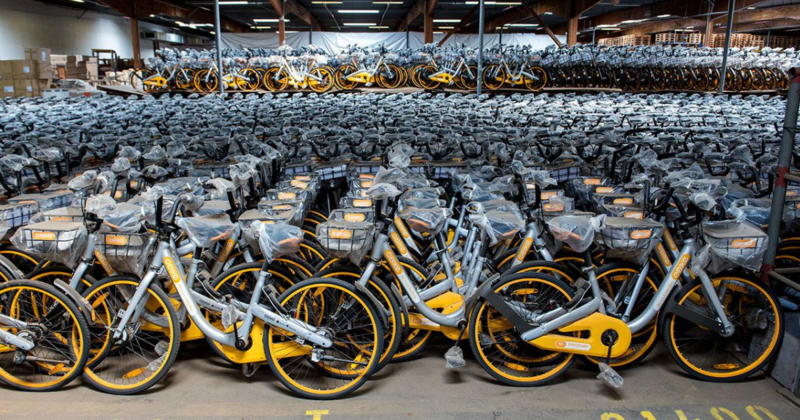 Now, a new report stated that oBike Asia “owes at least S$1.7 million to creditors and users, and in costs” accumulated from its closure in Singapore. Excluding liquidator fees, TODAY stated there is a total of $743,189 worth of proof of debt from about 30 creditors. Creditors including town councils, suppliers, and the Land Transport Authority (LTA) were owed money with logistics company West-Street Carrier being owed the largest sum of S$130,753. Bishan-Toa Payoh Town Council’s proof of debt is the second-largest amount owed at S$85,660, followed by another logistics firm, Channel Management Systems at S$84,682, while LTA is owed S$15,000. As of October 2018, a total of S$405,314 worth of deposit claims by 8,854 oBike customers were made. FTI Consulting’s fees are around S$600,000. According to TODAY, the bulk of oBike Asia’s running balance of S$481,449 on 15 October is made up of the scrapping of bicycles here. Enter Singapore-based Costa Rican Oscar Moises Chaves. In a separate report, TODAY has identified him as oBike’s “new majority shareholder” who is ready to pay off all of oBike’s debts. But his endeavour is met with an “impasse” as he is waiting for FTI Consulting’s “full breakdown of the amounts owed to parties here”, a request he made “months ago”. “You can’t expect me to just give (money) without seeing what I’m paying for. No one does that… everyone checks their invoices to pay,” he was quoted saying by TODAY. Chaves’ family was revealed to have sold off their textile-manufacturing company four years ago in a deal worth “hundreds of millions”. Following that, he ventured into investments and started up investment company OSS Inversiones, with two of his brothers. He told TODAY that he “first saw the potential of a shared-mobility business after witnessing the bicycle-sharing boom” and went to Shanghai, China in May 2018 to bring the oBike franchise to South America, “unaware” of the imminent issues. Chaves offered to “take over the company” when oBike replied him one month later, to which, the bike-sharing firm agreed, on the condition that he settles all of its debts. A month later, he “approached FTI Consulting” in Singapore for the breakdown of the debts incurred here. The 29-year-old now owns 66.9% stake in oBike’s global operations excluding the Singapore entity that’s in the midst of liquidation, according to TODAY. On 18 September 2018, the same day the former Director of oBike Hong Kong, Hu Jian, resigned, Chaves was appointed Director. When asked about the S$10 million transfer from oBike Singapore to oBike Hong Kong, Chaves “said he did not receive the S$10 million sum when he took over oBike Hong Kong”. Chaves’ reasons for choosing to invest in a failing firm were because he saw the “company’s systems and city licences, as well as ‘on-field experience'” as boons. He believes that by paying off the debts for oBike, people will trust in his “integrity and honour to do business” and will come to know of them. In April this year, Chaves plans to launch an e-scooter service in Singapore called, 0MN1, as he shared that bike-sharing “was just an entry [point]” at that time. It seems affected parties are getting impatient with the repayment progress as it’s almost been seven months since news broke. “We urge the liquidators to begin the repayment process,” an LTA spokesperson told TODAY, noting that FTI Consulting has been in constant engagement with oBike and its creditors, and encouraged creditors to be proactive in working with the liquidator. Priority is given to settling the costs and expenses for winding up the company “including the liquidator’s remuneration”. Unsecured debts such as user deposits are placed last. In other words, other affected oBike users who haven’t received their claims will not be getting back their money anytime soon. Even though former oBike Chairman Shi Yi has also offered to personally pay out of his own pocket, repayment of user deposits will still have to wait until payment to “preferential creditors” have been paid off.